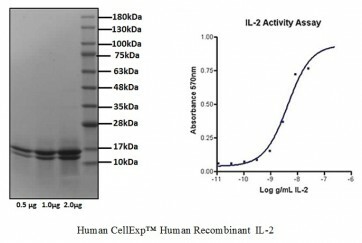 Human CellExp™ IL-2, Human Recombinant | 6461 | BioVision, Inc.
ED₅is typically 0.2 to 2 ng/mL. The specific activity was determined by the dose-dependent stimulation of the proliferation of mouse CTLL-2 cells (mouse cytotoxic T cell line). Reconstitute in sterile PBS containing 0.1% endotoxin-free recombinant human serum albumin. 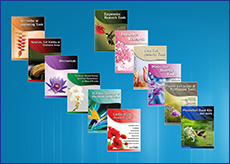 IL-2 is a potent immuno-modulator, which mediates a wide range of immune and inflammatory responses and is important for the proliferation of T and B lymphocytes. 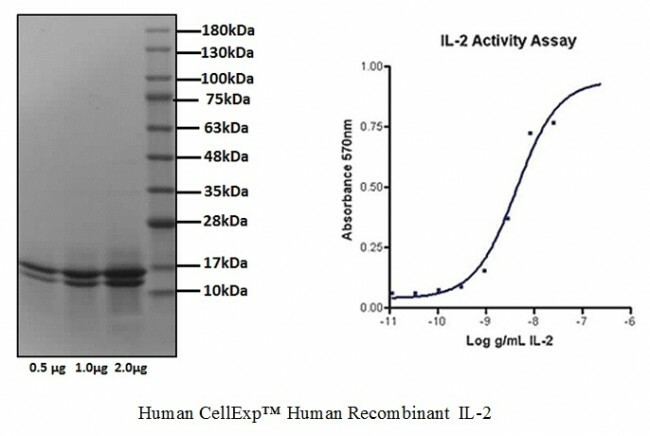 The receptor of this cytokine is a heterotrimeric protein complex whose gamma chain is also shared by interleukin 4 (IL4) and interleukin 7 (IL7). The expression of this gene in mature thymocytes is monoallelic, which represents an unusual regulatory mode for controlling the precise expression of a single gene. The targeted disruption of a similar gene in mice leads to ulcerative colitis-like disease, which suggests an essential role of this gene in the immune response to antigenic stimuli.